There are 6 different types of grenades in The Division. You can carry 3 of each of them at the same time. 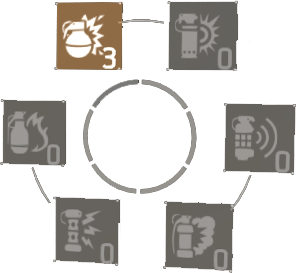 The most common being fragmentation grenades designed to detonate after a short amount of time and dealing damage to enemies, other variants will allow you to either engage or escape your target by applying different Status Effects to them. EMP grenades apply Disrupt, which will destroy any active skills caught in the blast. EMP grenades also prevent enemies from deploying any new skills for a period of time. Flashbang grenades deal Blind-Deaf, which will temporarily impair the vision and hearing of any enemy caught in the blast. Fragmentation grenades deal high damage and have a chance to apply Bleed. You can always get those grenades at restock boxes. Incendiary grenades release fire on detonation. This fire has a chance to apply Burn to any enemy caught in the blast. Burn will drain an enemy’s health over time. Shock grenades apply Shock, which will temporarily paralyze any enemy caught in the blast radius and also deal damage. Tear gas grenades apply Disoriented, which will temporarily impair the vision, as well as the accuracy, of any enemy caught in the blast.